My beautiful pet cactus, Cactus, is now officially a resident of cactus heaven. It was a good cactus, and I loved it as much as anyone has ever loved a cactus, but the Cleveland sun, especially the amount that comes through my window, was just not enough. Cactus had been looking a bit peckish for awhile, but I kept hope that it was just having a dormant winter. But on Wednesday, its head popped off. 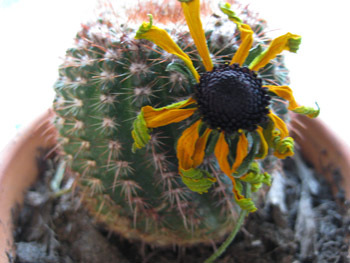 Goodbye, Cactus. My room and my heart are feeling rather empty, so I was compelled to make a memorial version of my beloved Cactus. Much less alive and much more cuddly, the presence of Plush Cactus is slowly healing the prickly hole in my heart. 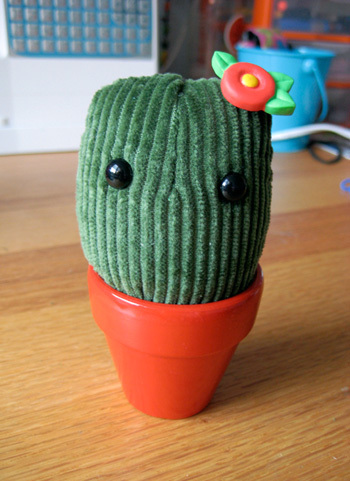 Plush Cactus is too charming, though! You come up with the cutest things. Wow, that is the cutest thing ever! Are you going to make more plush cacti for sale? Because I think I must have one. I think i must have one too!!!!! Sam, that is SSSSOOOO Cute !! Aw poor Cactus :( ~ The plush cactus is the cutest thing I’ve ever seen!